SOUTH PORTLAND, Maine, December 15, 2011—Hola Tequila! 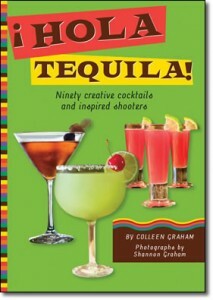 978-1-4162-0691-0; $15.95; March 2012) celebrates the unique and festive Mexican distilled spirit that is tequila. Its spectrum of flavors present a unique canvas for the 90 mixed cocktail and shooter recipes that are included in the book—many developed by the author—and will inspire readers to take a new look at this complex spirit. Author Colleen Graham’s enthusiasm for Mexico’s national drink is refreshing, literally. Using local, home‐grown, and easy-to-find ingredients, Graham includes recipes for inspiring infusions that naturally complement the liquor and her use of fruit, herbs, and spices has been described as magic. Featuring gorgeous full-color photography, the book features information on stocking the home bar, the different types of tequila, its history and culture, and production. Graham has served as the cocktails, mixology, and bartending expert for the New York Times’ Web site, About.com (Cocktails.About.com) since 2006. During her time as the Cocktail Guide she has developed a wealth of knowledge about finely crafted cocktails and mixed drinks. She is also a nationally certified bartender and has studied with some of the best bartenders in the world. As a tequila “ambassador,” she develops original cocktails for companies such as Hiram Walker and has visited numerous distilleries to learn the process of producing alcohol. Graham resides in Cedar Falls, Iowa. ¡Hola Tequila! is a 6″ x 8.5″, 128-page, hardcover book with jacket that includes more than 75 full-color photographs. The book will be available March 2012, and will retail for $15.95. It will be available in bookstores and gift shops nationwide and through Sellers Publishing’s Website, www.sellerspublishing.com. Sellers Publishing, Inc. is an award-winning publisher of books, calendars, greeting cards and journals. The company was cited for four consecutive years by Publishers Weekly for being among the fastest growing independent publishers in the country. It is located in South Portland, Maine and can be contacted at 800-625-3386 or by visiting their Website at www.sellerspublishing.com.